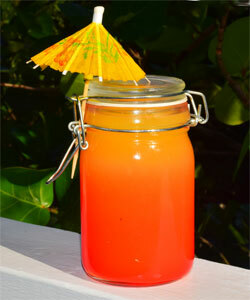 Mix orange juice, water and rum in a small mason jar and stir. Add Grenadine very, very slowly by pouring it into a teaspoon that has its tip against the inside of the glass so the Grenadine slides down the side of the glass to the bottom without mixing with the orange juice. Wait for it to settle before serving. Be patient. Hang fru fru umbrella on closed lid of jar.